Welcome to our live updates on the final lap of the Channels International Kids Cup 2018. 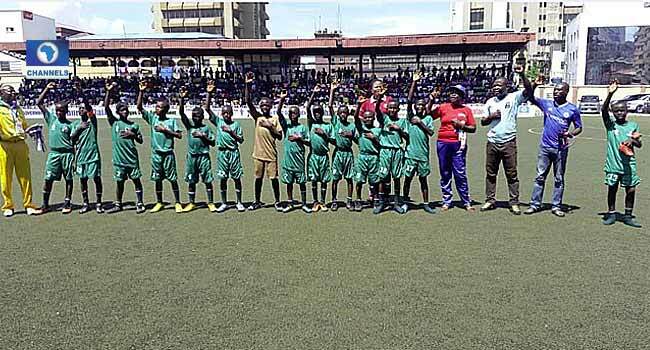 The 10th edition of the competition is taking place on May 27, at the Campus Square in Lagos, where LGEA Central Primary School from Kwara and Baptist Primary from Osun state are battling for the grand prize. Also, last year’s bronze medalist, X-Planter will take on the kids from Ekiti state in the 3rd place match, just before the main game begins. The competition is one of Channels Television’s Corporate Social Responsibilities. As part of the line up of activities for this year’s finale, singer, Ice K who was a member of the now-defunct group, Artquake, is expected to perform. On Saturday, the participants and guests were thrilled by the performance of top female DJ, DJ cuppy. 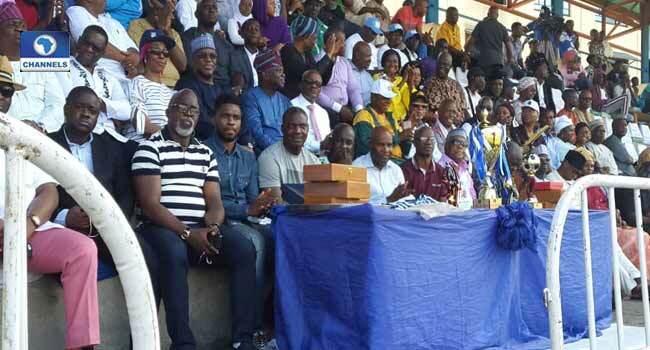 Earlier on in the week, former Super Eagles Captain, Joseph Yobo, paid a surprise visit to the participating teams. 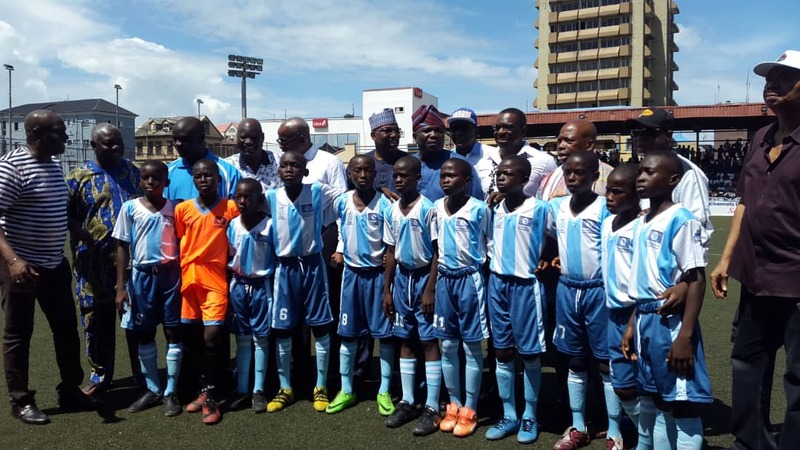 Also, the Minister of Youths and Sports Development, Solomon Dalung, paid the players a visit while they were out on the field. 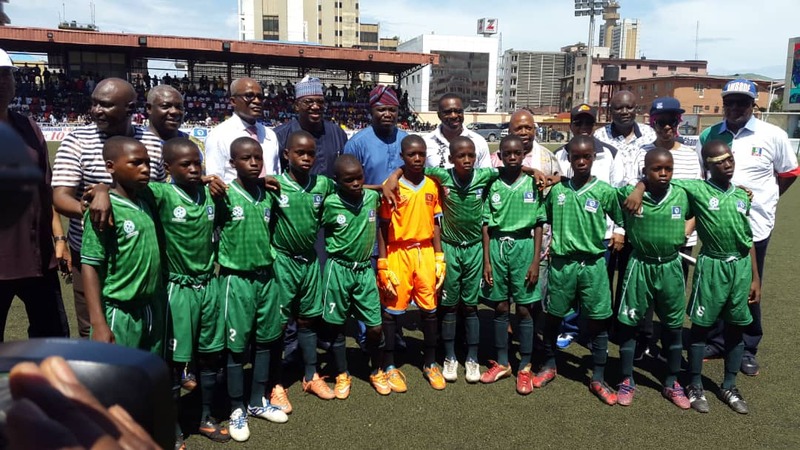 Mr Dalung, who was on an official assignment in Lagos, made the stop at the Teslim Balogun Stadium, Surulere on Thursday to cheer up the teams participating in the tournament. Stay with us for the updates. 1:45 PM: 3rd place match between X-Planter Private school and Emmanuel Anglican Primary School commences. 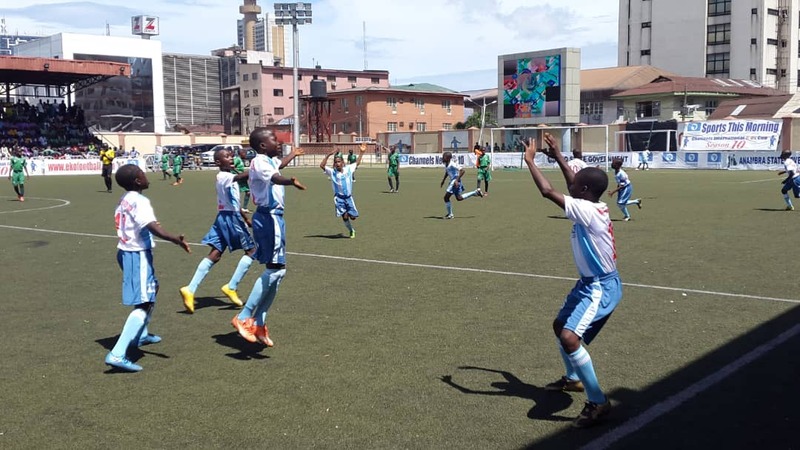 2:00 PM: Emmanuel Anglican Primary School scores one goal to win 3rd place. Emmanuel Anglican boys sining their state’s national anthem after beating X-planter 1-0 in the 3rd place match. 2:00 PM: Singing of the National anthem ongoing in preparation for the match between Kwara and Osun. Kwara boys jubilate after their first goal. 2:28 PM: A Kwara player made a hard tackle against an Osun boy. 2:29 PM: The Osun side utilised the chance and equalised. 2:35 PM: The Osun team are now mounting pressure on the Kwara boys. 2:36 PM: Fans react after the referr awarded a free-kick against Osun. 2:41 PM: It is now halftime. 2:42 PM: Kwara and Osun coaches take some time to encourage the boys. 2:46 PM: Nigeria Football Federation (NFF) President Amaju Pinnick and former Super Eagles captain, Joseph Yobo, arrive. (NFF) President Amaju Pinnick and former Super Eagles captain, Joseph Yobo, among others at the Channels In. Kids Cup 2018. 2:48 PM: Second half commences. 2:53 PM: A player from the Kwara team is down with an injury. 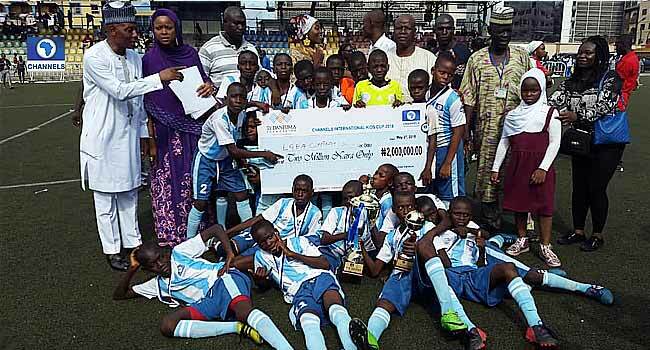 3:00 PM: LGEA Kwara wins beats Baptist Primary three goals to 1 to win the Channels International Kids Cup. 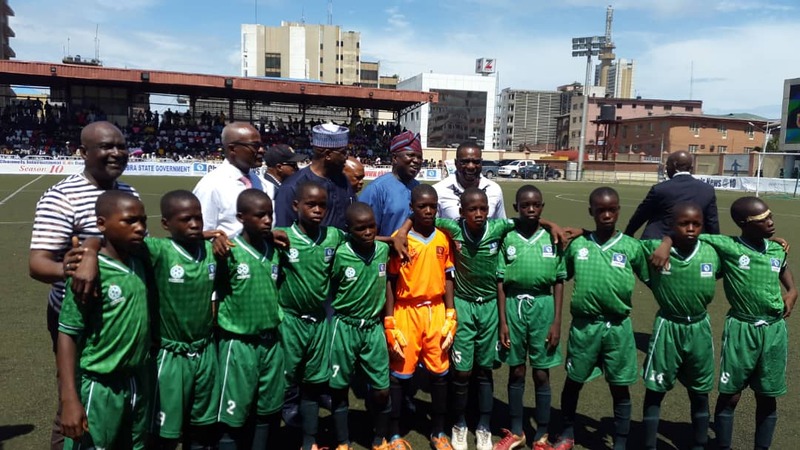 The Lagos state governor rewarded the top four schools with a sum of five million Naira. The winner, LGEA Central Primary School received two million Naira, Baptist Primary School which took second place was given 1.5 million Naira while Emmanuel Anglican Primary School in third place received one million Naira. Thanks for staying with us.